Skylights flood the open floorplan w/natural light, while vaulted ceilings & 2-story fireplace anchor the great room. Newer upgraded TRIPLE-pane low-E windows insulate well! Almost $7000 worth of new flooring, including beautiful new engineered wood on both levels & new carpet in the main-floor bedroom! New interior paint in the main areas & new water heater! Generous eating area with a large window off kitchen & room for stools at the kitchen island while you're cooking. 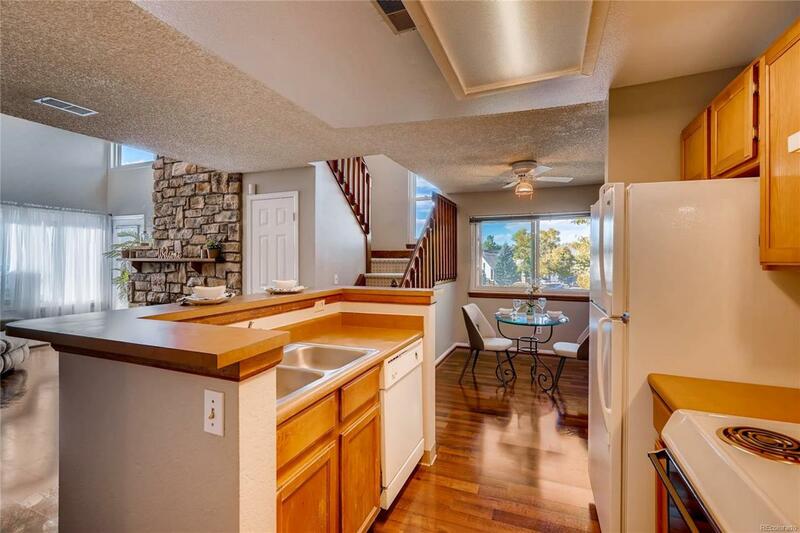 Main-floor master has a 2nd west-facing balcony & 2 walk-in closets! The entire upstairs loft is its own suite, perfect for the master; use the main-floor bdrm for kids or office. This particular unit is west-facing & at the far end of the complex with plenty of parking...best location in the complex! Complex has its own pool, tennis courts, & playground. Easy access to I-70 & Hwy 36 in a convenient Arvada location...walk to restaurants, shopping, & Lake Arbor all only 2 blocks away! Check the comps...a great value! Offered by Expert Real Estate.